Most people will think..Well that’s easy & maybe to some people it is..It could also be why it is such a popular choice and I might add still going strong. When we’ve seen ‘vintage’ come and go and come back in some forms again. 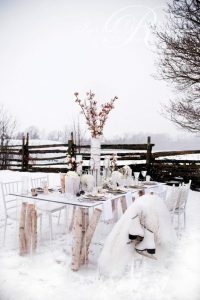 Still so many people love the idea of a rustic themed wedding. Rustic is a very loose term and can simply be a bride thinking she wants the opposite of a slick contemporary look. 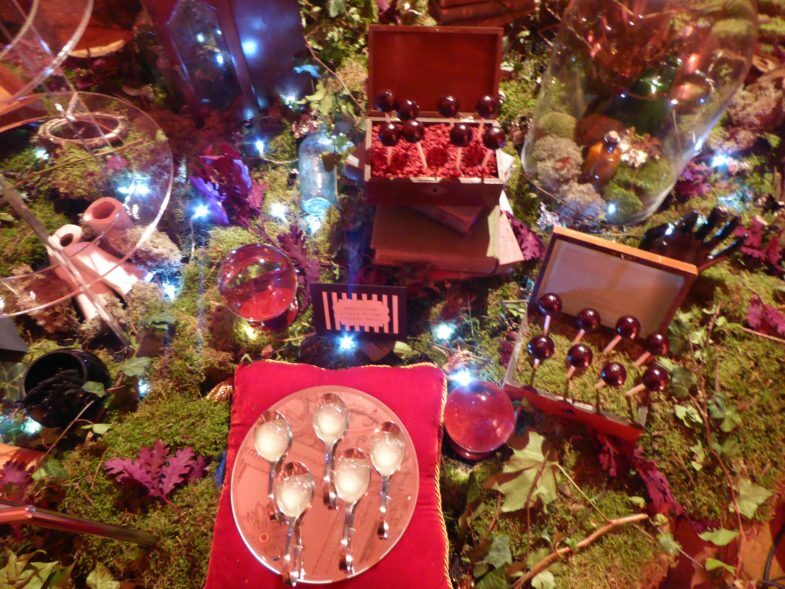 Or for some they choose to style everything down to the favours in a strong woodland / rustic theme*. That’s their take and there really is no right and wrong. You should use your own artistic licence here. 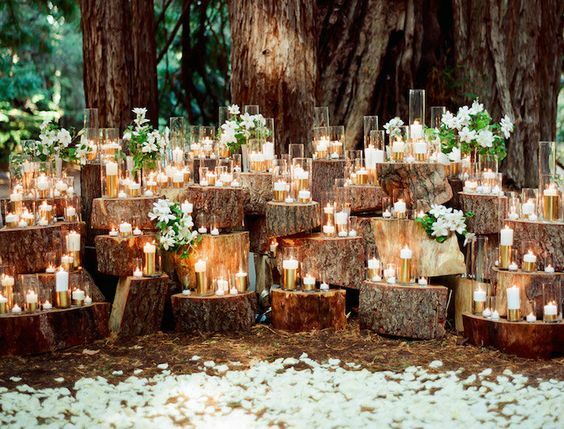 For example if I hear woodland I think a cute outdoor space to dress. 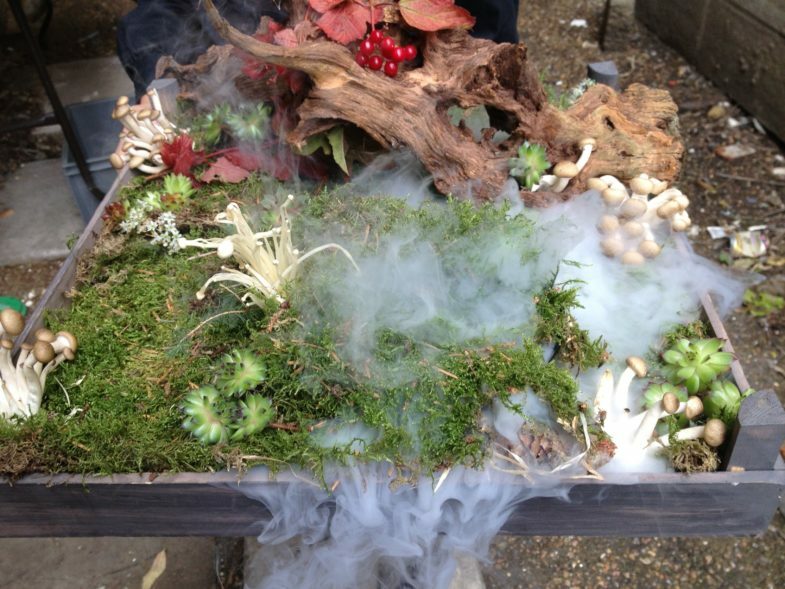 But the client may be trying to recreate that mystical forest outdoor theme inside top to toe. *I love this image found on pinterest of the detail you can go to. There are 3 main ingredients here. Top of the list is tree slices, these are used mainly to elevate the design whether it is for cakes, buffet, food station or a photoshoot. Candles give that magical look. Moss fills in the gaps. Then anything else you add leads it in one direction or another. Apple crate definitely more rustic. Pine cones & leaves will take you more strongly to the woodland path. Although as I said before both will intertwine. 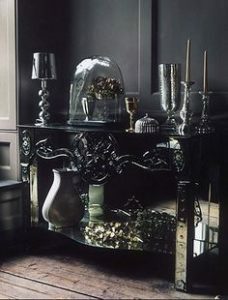 This one on Pinterest is utterly gorgeous with just three (my magic number) items. Logs, candles & flowers. Right down the middle rustic and or woodland. Gorgeous. These are my version of how you can elaborate on a woodland theme. 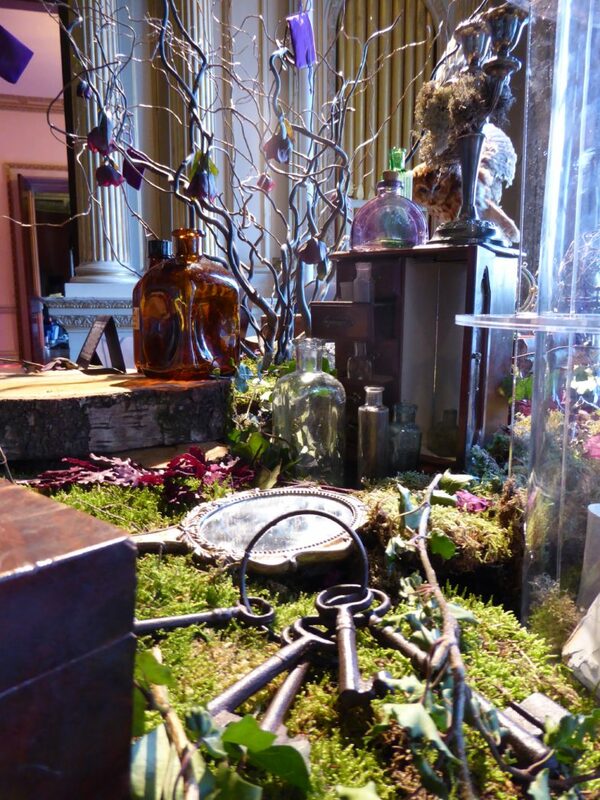 The extra props I used on both pushed into an enchanted forest theme complete with potion bottles, branches, bones, ivy and mystic balls. The styling always looks the best if you can elevate it so the eye is drawn comfortably around the spectacle in whatever form this may be. It won’t look anywhere near as impressive if you have to look down onto a flat table. Get some large pieces in there to really lift it in my case here for this wedding at the garden museum – apple crates and plenty of them. Get it high. Many of these props can now be hired here and if you don’t see what you are looking for do get in touch on the contact form. 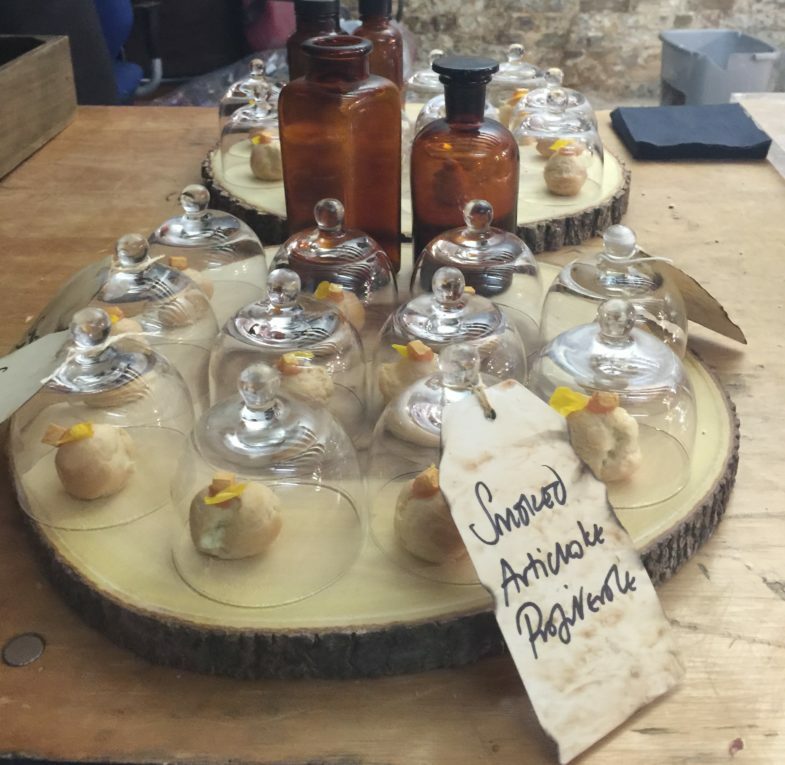 Here’s some rustic themed canapé tray styling to complete the look. These weren’t all created for the same event. So try and stick with something that matches and runs throughout. For example I would continue using these Shimeji & enoki mushrooms throughout the rest of the displays. Where do I find the most stylish hire equipment. Are you looking for the best furniture hire around. Are you a bride and this is all new to you? 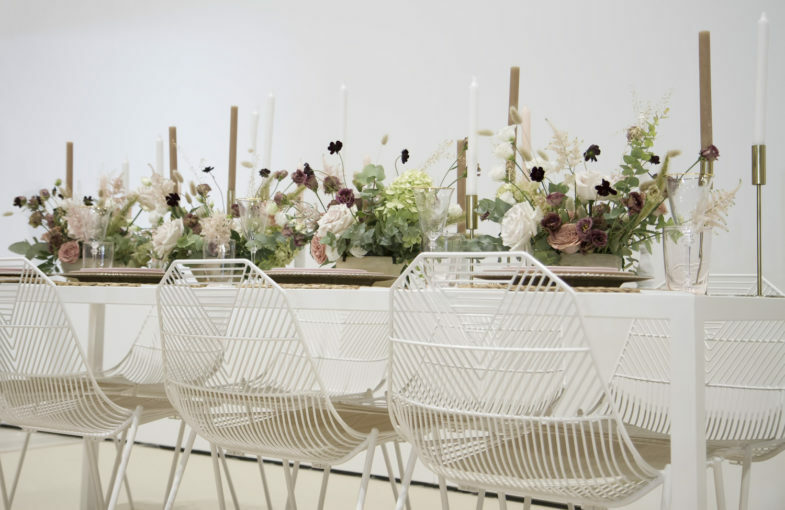 Or are you an event planner with little time on your hands to research the hot new Furniture Hire places? Either way I can guide you with some tips. The good news is that there has been an explosion in luxury hire furniture in London (& I’m sure the rest of the country) with great companies literally springing up. I’m not talking about the standard stuff that we’ve all seen before. There’s really no excuse for generic looking event furniture now. We are talking the sort of swoony sofa’s that we dream of lounging on at home. The real deal. And those oh-so-on-trend gold wire pieces to go with them. 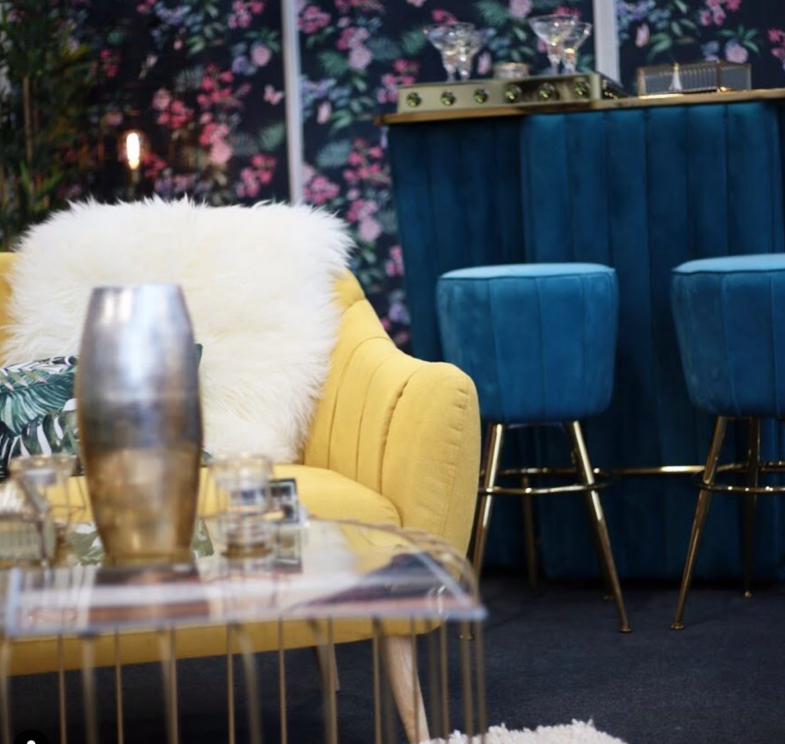 My top contemporary furniture hire companies. Hire it. This is a stunning wedding or intimate dinner set up. They have some bang up to date pieces. Work well for out of town events too as they have lots of uber-cool garden furniture for marquees and country garden parties. 2) Granger Hertzog. Ok these guys have one off pieces ideal for photoshoots and the lobbies of venues for example. But you won’t find huge quantity of any one thing so don’t go looking for your wedding breakfast seating here. 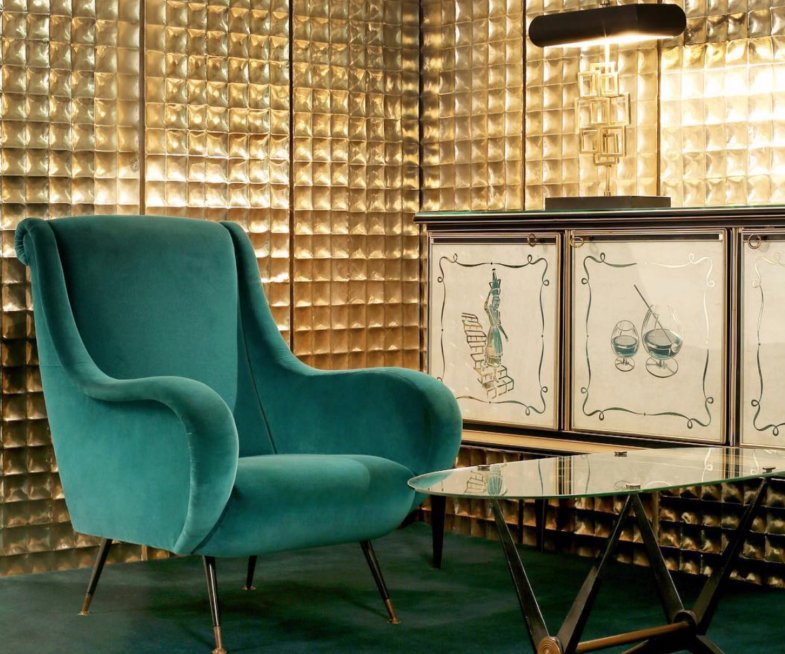 They do have artwork, ornate mirrors, art deco vases & lamps and rugs. This does mean you need to go & physically pick out the pieces here to style you event/shoot. You get given a trolly and whizz (ok not whizz – as there’s some mighty pricy artefacts in some of those aisles) around. 3) Juno hire. 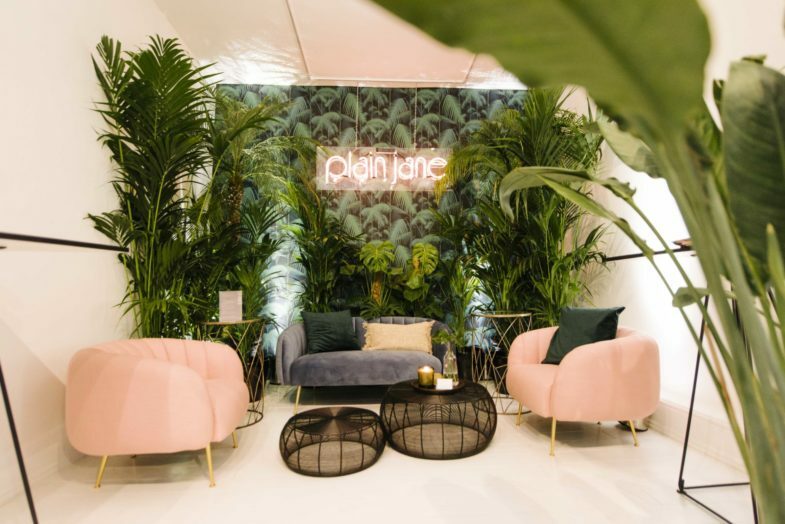 These guys slammed into my radar only this week and again I have to say “wow!” Just look at this set up (for Plain Jane Events I imagine). I mean this is what dreams are made of right? Pink velvet AND gold geometric. Five stars for these folks. 4) Furniture on the Move. I’ve always thought of this company as being suppliers of heavy, almost industrial equipment like metal chairs and wood pallet bars. My view has changed now as I saw their range this week and it turns out they have all sorts of yummy soft furnishings too. Add them to your list. 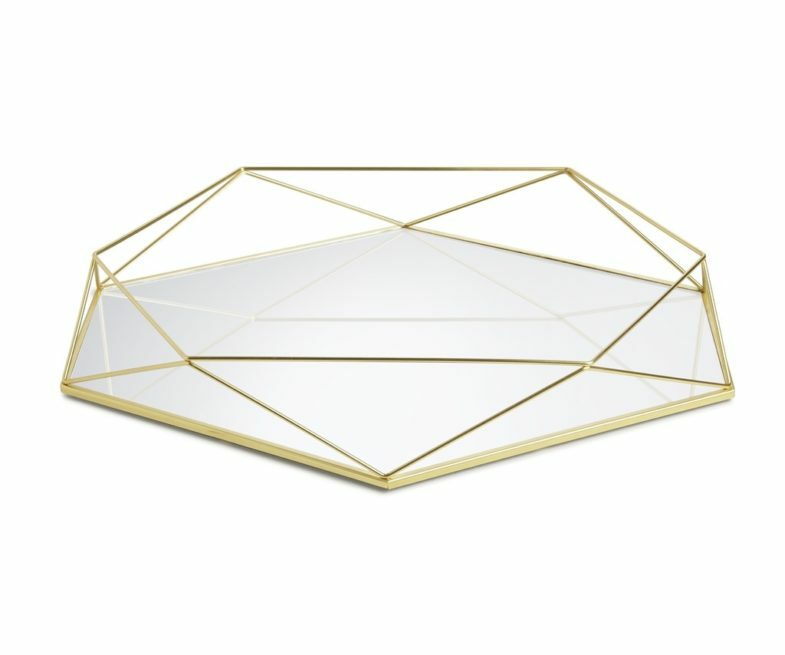 How nice would this tray work with the above look. We have 2 available for hire here. Which we’ve had adapted. They have mirrors on both sides to work either way up – one way as risers for that stunning looking buffet and also they can be carried as drinks or canapé trays. Here’s the links to my top four from above. Ok I started this blog post nearly a year ago to the day on 1 Feb 2018 . I’m pleased to learn that I’m not fickle as I thought as this post is still very much valid in my mind. However it also demonstrates that perhaps I need to upload & share some of these blogs and stop procrastinating. I don’t do patterns. I don’t own any patterned clothes. My wardrobe is black, white, grey. Then a splash of yellow & orange with some acid colours for good measure in the summer but still then only block colours; never patterned. When it’s totally up to me my events are usually similar – ultra contemporary, not fussy. 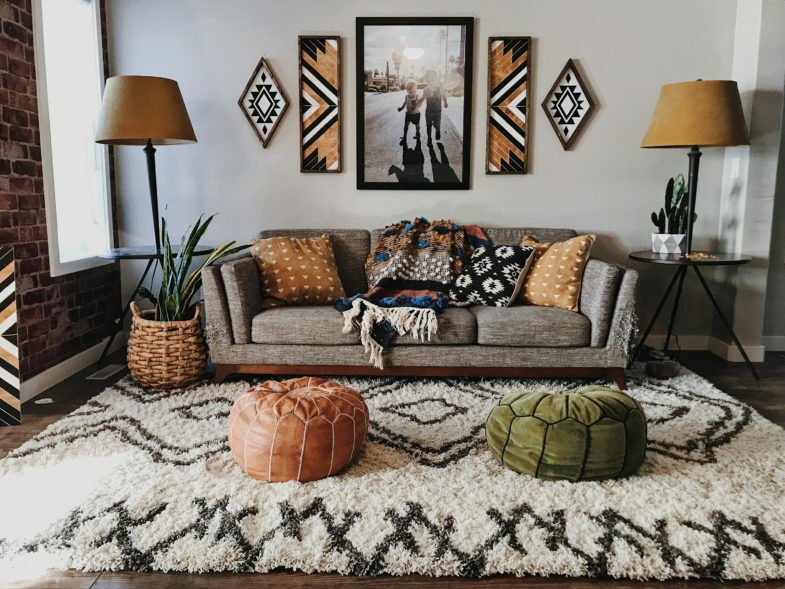 However the plates are shifting & I’m loving the ethnic boho vibe with all those patterns & textures, These aren’t necessarily new: they’ve been around for years. But this mix really started to take hold at the end of 2017. I really think this one is here to stay for a while. More about why I think that later. My home has always been a stripped-back, clinical white space. We lived in a loft apartment for 9 years which was basically a split level white box. No picture on the wall. Only one photo (our wedding) displayed. No identity. I’m not sure why other than it always felt too cluttered with different colours & ‘things’ everywhere else. Even when I was really young every detail had to be matching. Even my little battery alarm clock wasn’t spared. It had to be painted black or white to match everything else. Yikes.. OK: I was strangely into interior design & style from a very young age. Don’t get me wrong I’ll always have a place for a strong contemporary looks. But perhaps I’m craving a little more comfort. 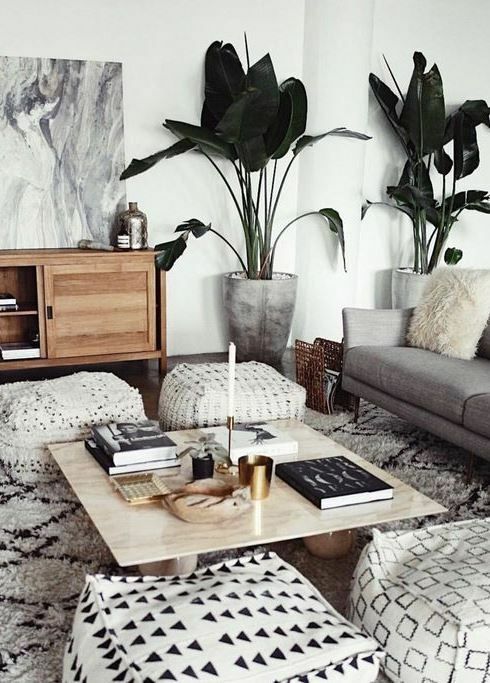 These boho patterns & textures are part of the bigger picture. 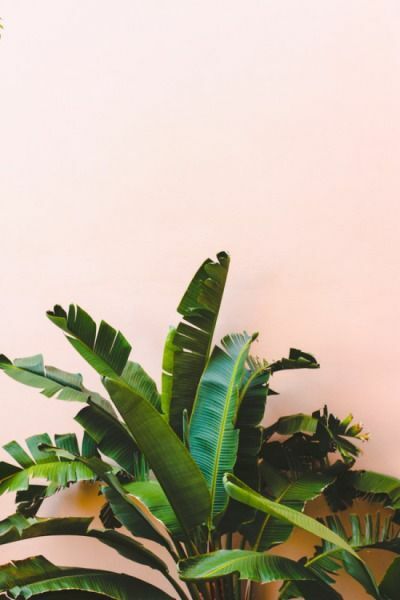 Which is the growing use of natural materials. Woven goods are huge right now. Every cheese plant is feeling right at home in a woven basket. Natural wooden floors look fantastic with a zigzagged patterned black & white rug. Yes I said ‘look fantastic’ in the same sentence as zigzagged pattern.. My husband would have though I had a guest writer in if I had actually published this last year before I started dropping the Z word into conversations Haha. 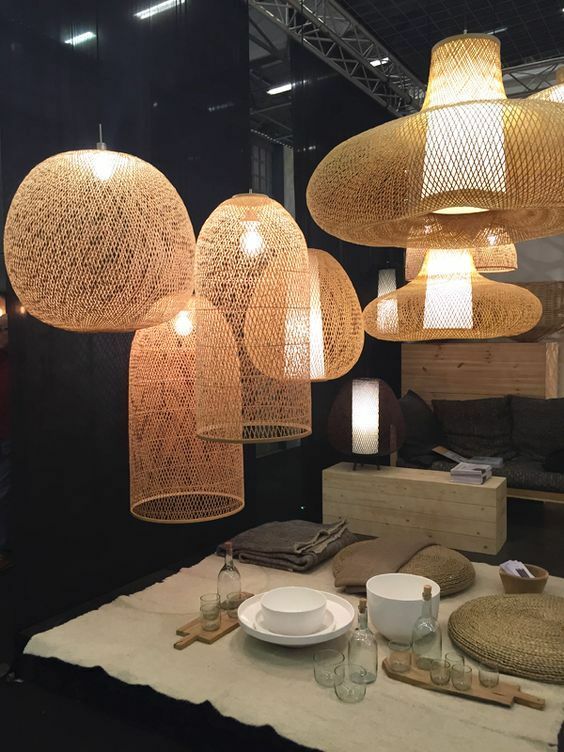 So a move towards wicker, cane, anything woven, rattan, tan leathers, wool & natural fibres is the way forward. Well it’s a solid change. 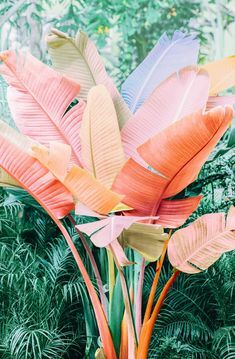 It’s not news that I’ve love plants. Not flowers so much, just for the record, but the big phat (is that actually a word? seems somehow appropriate here) leafy strong greens. I’ve gone on about this in previous blogs so there’s no need to go there. But it’s more than that. It’s the shift to sustainable products. We are becoming aware of what we use and it’s spreading to our surroundings too. 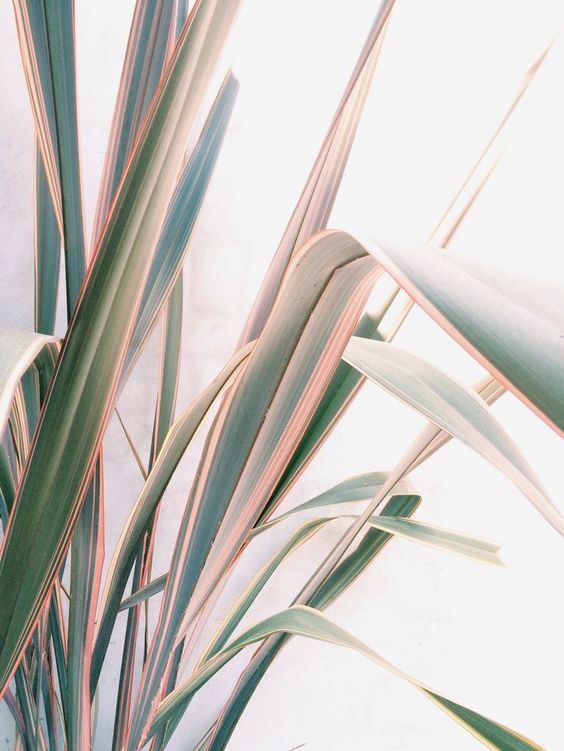 We’re thinking about where our purchases come from & we’re becoming more conscious. 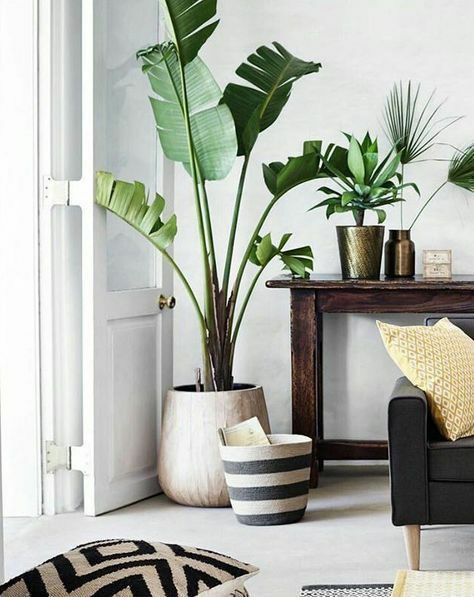 For myself personally however a toned down a version of the patterns and concrete (Yes of course I still adore concrete) textures can be brought right into the modern home. Drag in that sophistication of the good old Scandi magic and we’re heading towards an absolute winning formula. Ok if you’re still not sure I’ll meet you in the middle. How about the below. Add in some more creature comforts for y’all, Ideally it won’t be complete without a frayed rattan light shade and some cane furniture and then you’re on! But if you want to stick with me and throw ultra modern into the old 70’s look and that’s where we’re going with this look. We need to work out how we create less environmentally damaging events. Unless you have been in space for the whole of 2018 it will have become horribly clear what we have actually done to our planet. We didn’t realise we were doing everything so wrong. Plastic is lighter than glass meaning transportation is cheaper & easier. So instead of being that return and reuse society we once were, we’ve became a throw away nation ..ok world! We didn’t realise that every single piece of plastic ever made is still on the planet. This year has been the one of stark realisation for me & most. For some time we have seen images of the floating plastic island that’s 3 times the size of France. But now every social media is showing the next stage. These bottles, cups, fishing line and so on become brittle and break down, being ingested by fish, sea birds and wildlife, potentially killing them and I’m sure it won’t be long (maybe it’s happened already) before a shard of plastic is sticking out of our fish dinner. We need to all take blame and do our bit. There are some industries that are worse than others for waste & I’m ashamed to say the events world is a big bad culprit. We can’t hide any more. We have to do something. I have worked in and seen many of London’s catering warehouses and I can see many ways to reduce waste in general (I absolutely hate all waste from food to plastic and everything in between and that goes for leaving offices full of computers on over night. It’s still a resource that we are wasting!). Make or buy rigid boxes for trays & glass wear. Send it to the event like this. It actually makes breaking down at the end of the night quicker. Even better if these boxes have a photo attached of what should be inside. Makes stocktaking easier & most efficient. For unusual shaped fragile items with no box, protect all sides with cardboard. Kitchens and offices receive goods every day in cardboard boxes. It’s a free resource and it will reduce on what we have to pack down into our wheelie bins. Double win. 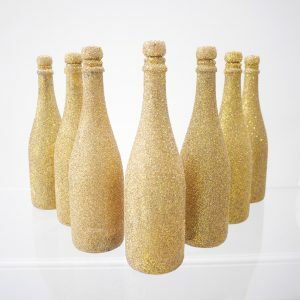 If we have to use glitter (and this has been my biggest faux pas), then we need to use something that is either biodegradable/edible or use an adhesive that holds all the glitter in place on the item so no bits end up in our river & streams and finally into the sea. Stop cling-filming glass. It invariably ends up on site smashed within the cling film… It does not protect it… It IS single use plastic.. Keep the cardboard box it was bought in and label it clearly. Send it on the event like that. If it needs a dust wipe it over when you use it. Absolutely no plastic straws. These should be well gone already. There are paper, bamboo & metal alternatives. No question. Say no to the guests wanting their mini dessert in a dispo plastic bowl from Plastico with a mini plastic spoon (sorry plastico we know you are trying make to changes too. )* There are now so many beautiful reusable small bowls and cutlery around this should no longer be an option. Don’t buy bubble wrap. It’s that simple cardboard & newspaper should and will replace it if it is not there to use carelessly. I say quick fixes because we have so far to go. However imagine if we ALL start with this. I don’t believe replacing items with corn starch is the answer either. Imagine how much land we will have to start destroying to produce enough corn to make the starch. Sadly we have to change our throw away nature and simply wash and reuse. See how much better it looks. 2019 is going to see changes in what we serve and we are going to go back to nature a bit more with design & materials. *I watched a short film by Plastico who have suggested they will start collecting glasses up from festivals and events and re using them. Ok but they may have forgotten about the range of other events that we put on every day of the week. This date in the diary is a great excuse to get creative with your pumpkins and have some fun with your table centres.. 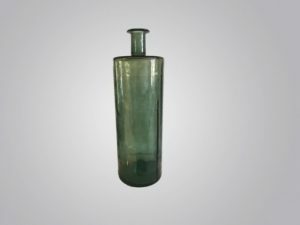 This one is one that you can work with the tablewear you have at home or can hire in for your event. I failed art so plurlease don’t tell me you can’t do this one. 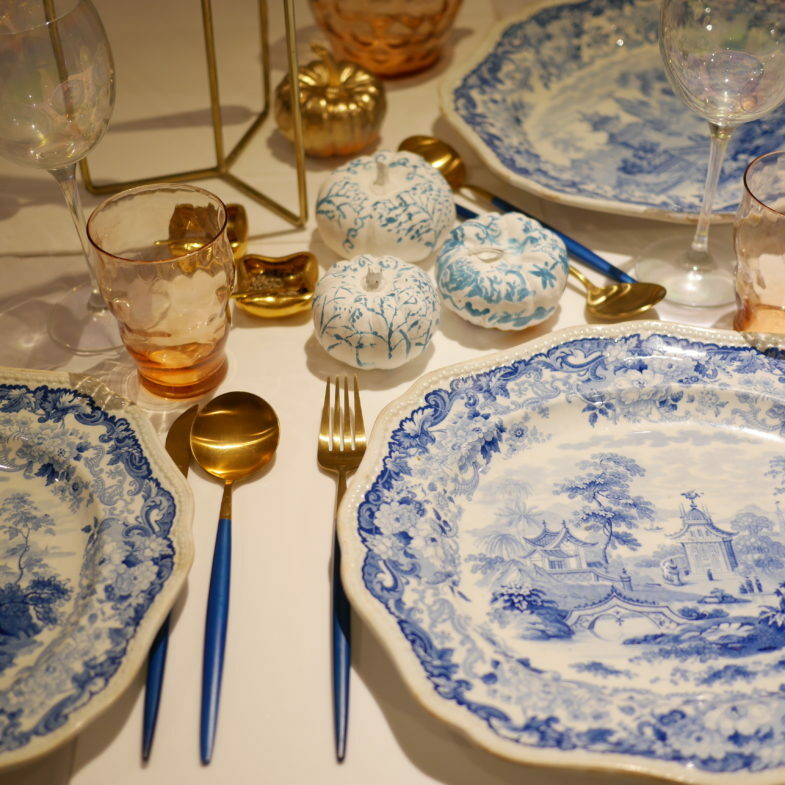 All you need is some white paint and the follow a similar pattern to what’s on your plates. If they are striped do stripes.. Everything ties in beautifully and it makes you look like a domestic goddess. I saw this on Casa De Perrin. Yes again! and decided to try it. Of course theirs is better but I had fun building this tablescape and so did our guests so that’s all that matters. Chalk and cheese! Uber chic and modern. 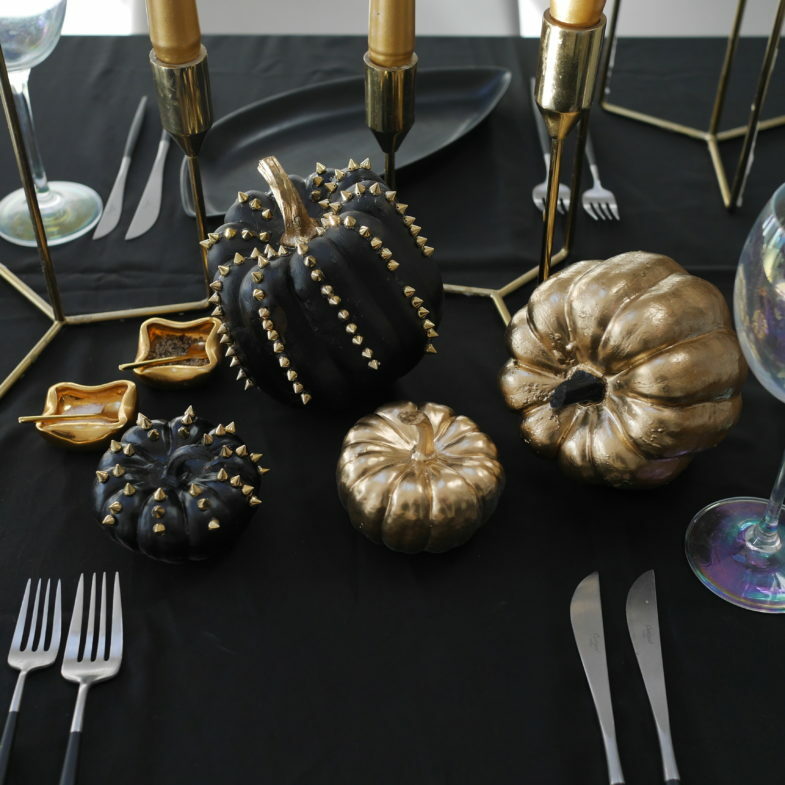 Why not add something funky to your pumpkins to match your cutlery. These are munchkin pumpkins they are a beautiful shape & accentuated when spray painted gold. I do love black and gold so this one is the winner for me. Who’s going to invite me around for next years Halloween dinner party. 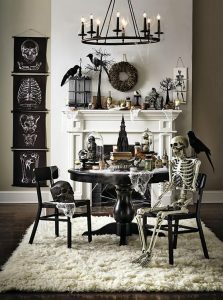 Are you wondering how do I style a halloween party – A grown up one? Let me throw you some tips so you can wow your friends at home. Choose your colour scheme. Traditionally there’s not much to play with here. Black, orange, red, purple, gold are about your strongest colours for this time of year and this is plenty! If you remember my rule from previous blog posts you’ll know to stick with 2 or 3 colours to keep it slick. Up there at the top of the list should be to decide what sort of party you want to hold. 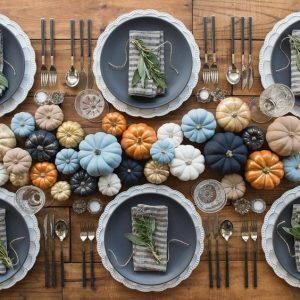 Like if you are having a dinner party where you’ll want to dress the table or a stand up drinks you can decorate more of the room. This is loads of fun if you’re having a drinks reception. Theres a focal point and it gets everyone fully immersed. Likewise this dark moody dresser could be propped with some ghoulish props or kept gothic and moody..
For dinner parties or events you can still go super stylish and have as many gourds and pumpkins as you like or none at all and get really creative. I utterly love this company. 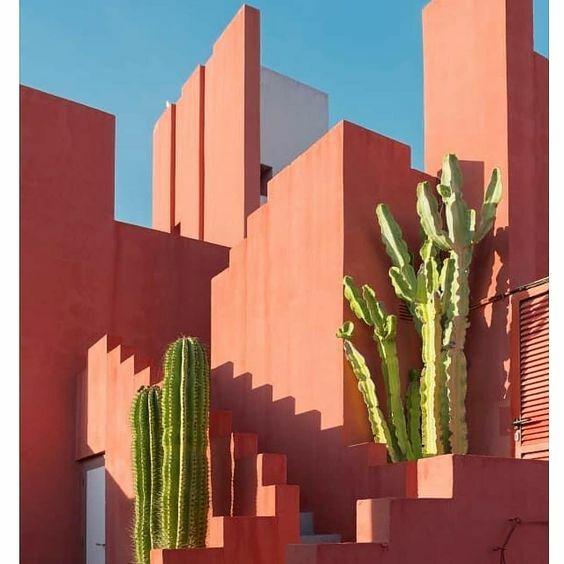 @casadeperrin on Instagram. 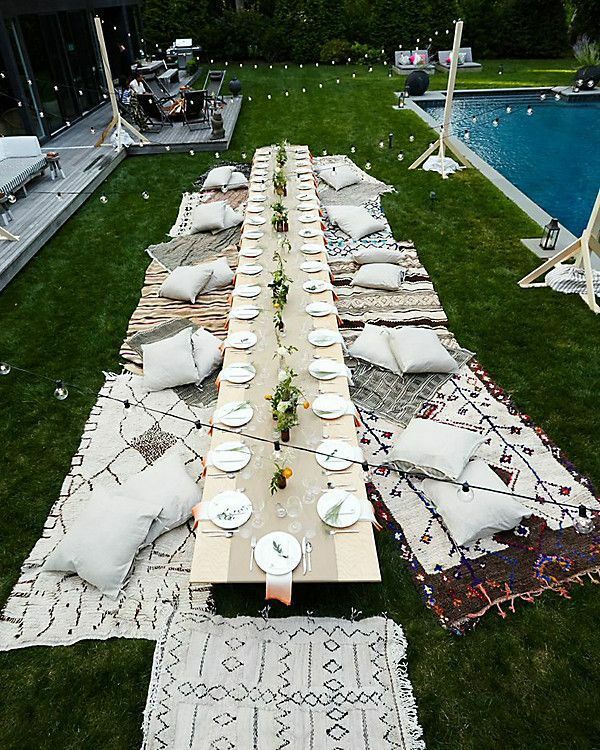 They do all sorts of table top curation & rental in LA and are the absolute best! I also love this image on Lettice event Pinterest page. It’s macabre but also delicate too. Big up – if it was their super cool creation. You know how easy this would be to do. You can buy mirrors like this from Ikea and using those spray paints to distress the frame and the mirror adding the skeleton with a glue gun. Hey presto you have a great feature. 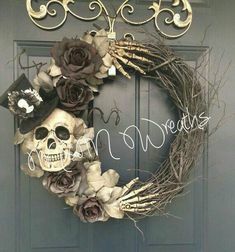 No halloween party is complete without some front door decoration. This is mandatory. It helps your guests know where to come and gives them an exciting taster of the stylish event they have waiting for them inside. If you want to remind yourself of a previous halloween blog post with one of my fave mood boards check it out here. 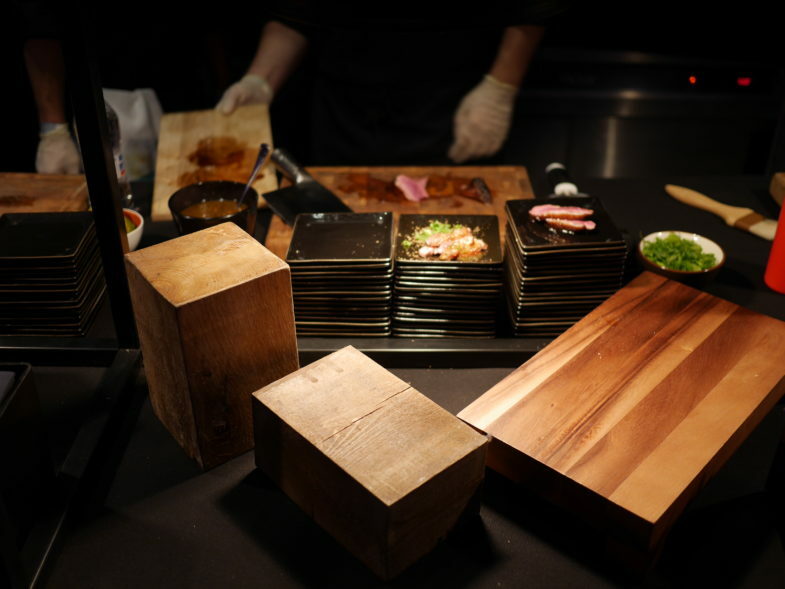 We are seeing a shift from purchasing to hiring canapé trays with our event industry clients. Everyone wants the new latest thing and to stand out & be different so it’s hire all the way now! -Exciting & interesting pieces that move with the times. -No need to find storage space for the stock. -No need to invest in stock that will go become yesterdays news. I started out designing pieces for sale. However in an ever changing world when everyone is trying to keep up with the times & keep inovating. Clients are no longer investing in these very expensive trays. And I have had to keep up and adapt to what people want. So much so that I have removed sales from the website altogether, which leaves me time to concentrate my time elsewhere. So along came hiring. 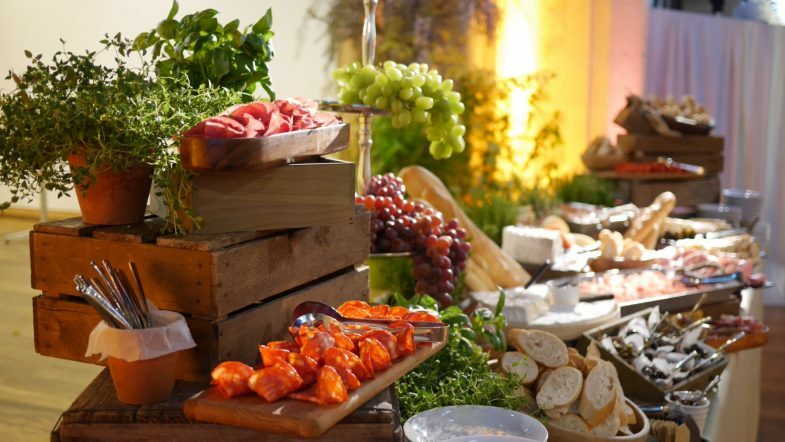 Caterers, hotels, restaurants, members clubs & wedding planners are coming to Tina Nisson Design looking for trays, often for large creative events & they charge the hire fees straight onto their client. It’s a winning formula all round. Our part of the bargain – making it as user friendly for clients to have what they need as easily as possible. I read an article in the ES Magazine and a wise person said ‘The assets people care about have shifted — we’re renting far more and experiences matter more than ownership. It’s the same with the events industry. Head to the hire page and take a look. at the range. 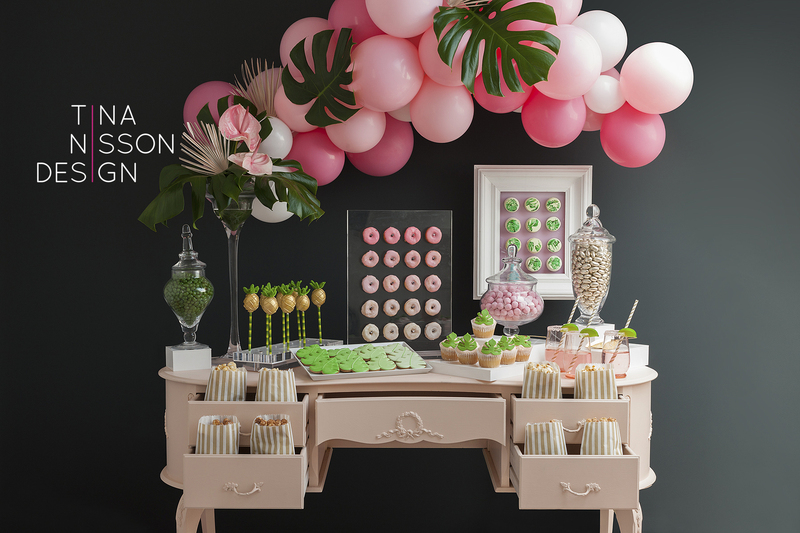 It’s not only acrylic trays now either, with an increasing stock from wedding & event design. There’s lots of unusual items that add something special to events. If there is something that you would love to hire on a regular basis get in touch & I will consider designing something new for hire. The best ways to style your own wedding. I’m often asked what’s the best way to style a wedding. Many people say they don’t want an actual theme as such but want it all to coordinate. 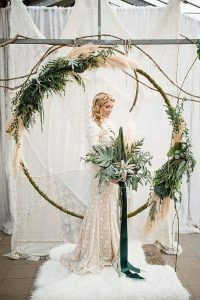 There are a few different ways to come up with your unique wedding design. I’ll list a few ‘ins’ to help you get started. See if you have any of these criteria. The dress – Perhaps you have your heart set on a particular style of dress – vintage for example. All styling will build from here. 2. Colour – You may have a favourite colour. You may have chosen your bridesmaids colours or you & your future husband may have seen a tie / suit colour that he loves. Pick a colour – any colour! 3. Location – Where you choose to get married. If you would like to get married abroad somewhere hot then the style can & will be determined from this. 4. Season – If you choose to get married at Christmas you have chosen this for a reason and will want to be sympathetic to that time of year. 5. 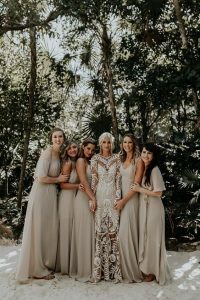 Theme -Some choose an actual theme like a festival theme – a really popular one for summer of 2018 or perhaps choosing something with even more styling like Great Gatsby or Art Deco. This is much less subtle but it’s a way for brides & grooms to really go to town on the design if that’s what they are looking for. Got a design. What’s next? So now you have the nuts and bolts of a basic design to embellish & take to the next level..Adding that key element to the rest of the big day is the next step. Lets set the scene. If you have found your dress first. Say it’s a boho style. – Another hot one for for summer 2018 . It’s lace so to tie in you would probably go for soft florals throughout your arrangement and try and incorporate lace in somewhere else. Table decor for example. Favours wrapped in lace and so on. Whichever is your starting point you then have many ways to tie in the theme..Table centres, Stationary, Favours, Ceremony backdrop & Flowers. Then as you are getting braver you can keep going further with finer and finer details. 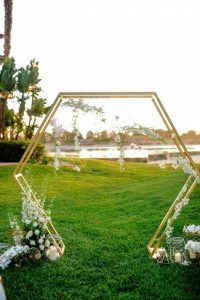 Wedding arches – why have one? Wedding arches basically create a perfect backdrop for your ‘I do’ moment. A lovely bride has contacted me to design her a fabulous one. Her ceremony is on top of a hill (with a knock-out sea view) so the arch will have pride of place. A wedding arch can be shaped however you like & made from pretty much anything. 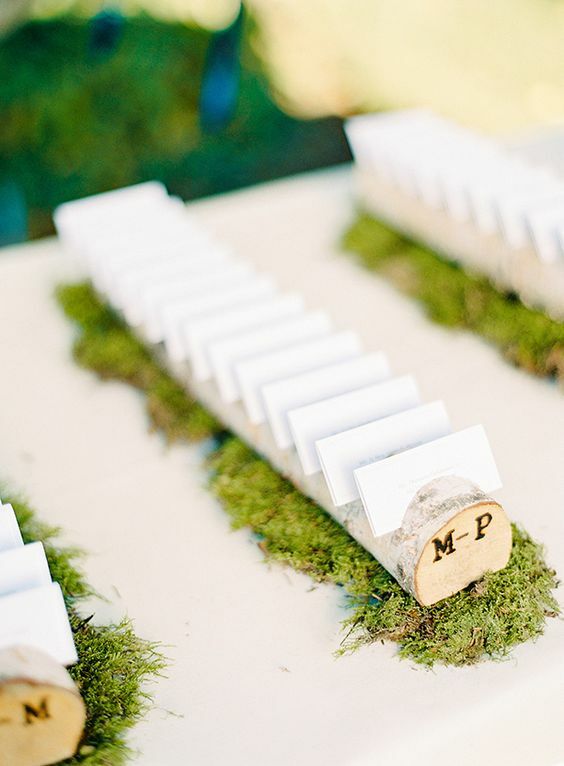 Ideally use whatever material features most in your wedding styling. Quite simply put, they frame you & your partner perfectly when you are saying your vows. That’s the all-time memorable photo opportunity with your loved one. The one time all eyes are on you. 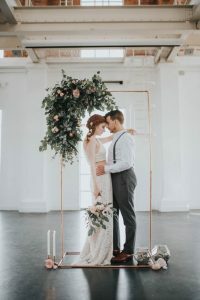 While a traditional church gives you a wooden framework around the altar that your florist can work with, anywhere else you have the exciting option of building something totally unique. I love the ones below. 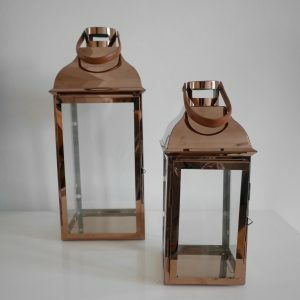 The first one is made from copper which I’ve become a dab hand at working with, creating all sorts of food stations & even clients cook book stands! Scroll through the carousel images at the bottom of my website here or check out a previous blog post. Since writing that blog post in 2015 copper has gradually not only filled events in every way possible, it has worked it’s way into almost every home and now of course naturally into weddings & it looks great. The other two are gold and work perfectly too. Here’s a sassy boho one. 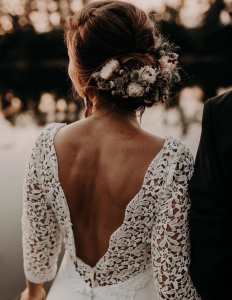 Floaty lace wedding dress essential with this style. It doesn’t actually need to be an arch. You could make something like this. There is a lovely backdrop using balloons on my wedding design page too. 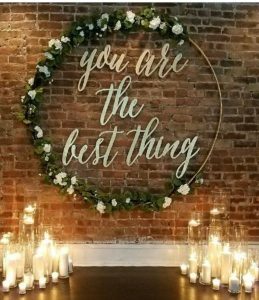 So whether it’s a back drop or traditional wedding arch you can have fun here and it’s such a great opportunity to get more of your personality into your celebration. Finally it can help tie the whole theme together. 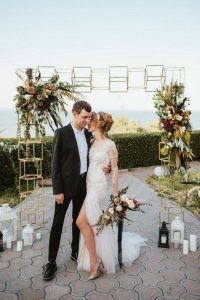 Head to my wedding arch Pinterest page for more inspiration. 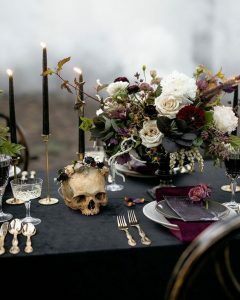 I was asked by my web developer where I get my inspiration for styling events from when we were trawling through a million photo’s of – & I admit some whacky events. I suppose I shouldn’t be surprised that people will be curious on how it all comes together because for the last 10+ years when people ask what I do for a living and I say event designer, it’s met with ooh’s & ahh’s & how cool is that. And I think it is to be fair. This started off with a cream dresser and I wanted to fit a small story into this. First place I went & where I go with every styling enquiry is Pinterest. I spend a good hour there trawling through compiling the right look for the project. When you read my last post (pardon – go read it now please!) you’ll know I’m into greenery so this design had to have lush large green leaves incorporated into the design. 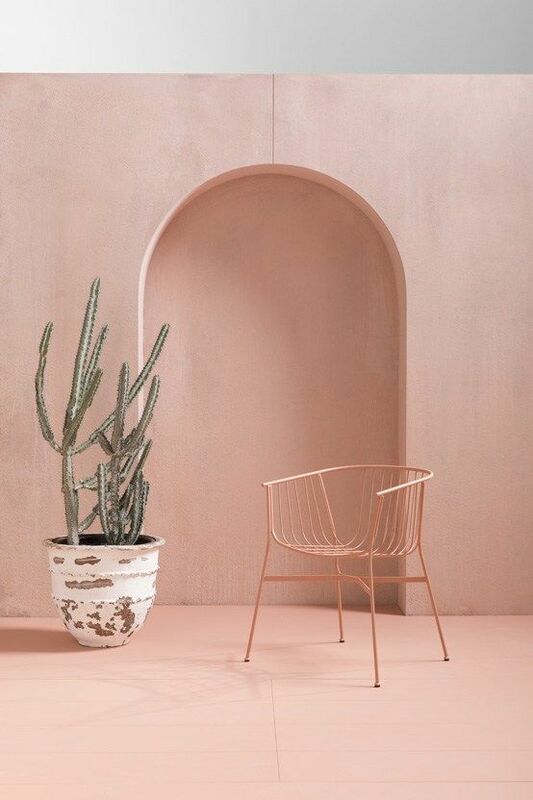 This year I got quite into dusky pink when mixed with a smidgen of peach. The blog post before.. Yes correct! I didn’t want to go tropical here (even though everyone was telling me to use the word tropical as a title for the key words YAWN!) but instead wanted to keep it a bit different a bit newer. After all I can’t do what has been done before me so other than the pineapples because I like them I was sticking with the simplicity of matt powdery pink & shiny green leaves. 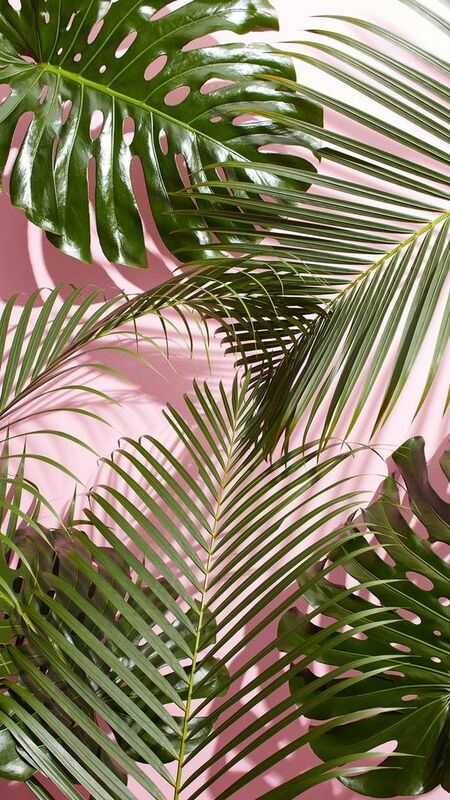 So plants on pink is my favourite title and if it’s not a key word then I’m sorry. So here’s a few images that got me going..
You just cannot beat a cheese plant for impact. This is why I have cupcakes, Macarons & cookies in it. I did paint a few of the leaves but the tones here are bang on. 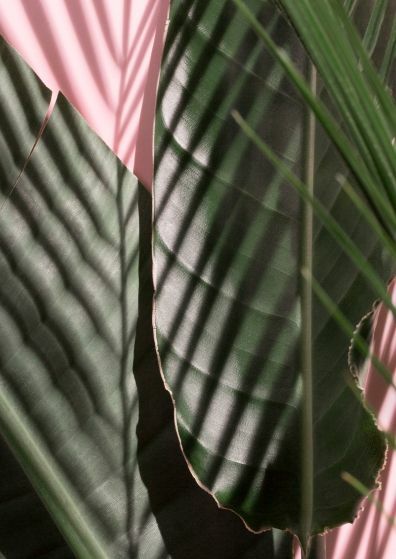 This plant actually grows with pink shades going through it. Natural beauty. So once I have my colour and my hero feature it’s now about adding the right props. Don’t add to many so it looks cluttered but enough to keep the interest. I don’t like to use too many colours in any one design when I’m styling events. This piece, now designed, is fully hireable as one piece for weddings & events. Clients can carry the design straight into their home. A bit like pouring a ready meal into your own ikea dishes and putting it into the oven for your guests to marvel at your handy work. You’re welcome. Have a look here for other designs. At some point in the near future, when I’ve leant the skill of adding a few more hours to the week. There will be a collection of these one stop shop designs. When the piece is finished I’m always wishing I had ‘just done that’ . In this case I wish I had shoehorned a few more Monstera leaves around the balloons. There’s always next time. 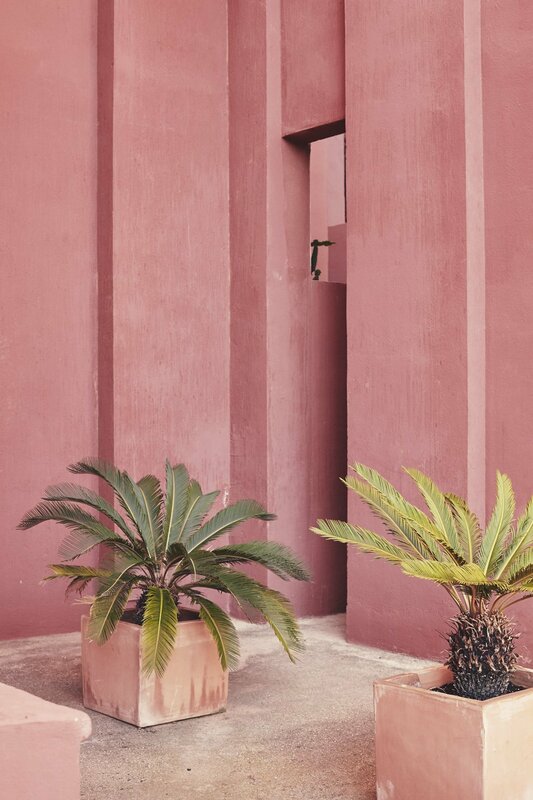 Actually the next one I want to work on involves more cacti & plants in a cool Mexican vibe..